26-year-old Terrance Harris was arrested on Wednesday after shooting a gas station employee in the face over nachos. Harris was charged with attempted murder and robbery. The clerk is still in critical condition. A man working at a Speedway gas station at the intersection of East 71st Street and North Keystone Avenue was shot around 1:15 a.m. Tuesday. Seven hours later, police arrested 26-year-old Terrance Harris on a preliminary charge of attempted murder and robbery. A family member watched the news and called to turn in the suspect. Harris was arrested at the Colonial Square Apartments in the 5700 block of Renn Lane. Only Eyewitness News was there as officers cautiously ordered Harris out. On the second attempt, he slowly came out with his hands up at which point officers then handcuffed him and took him in for questioning. Police say the suspect entered the store and began a conversation about nachos with the employee. 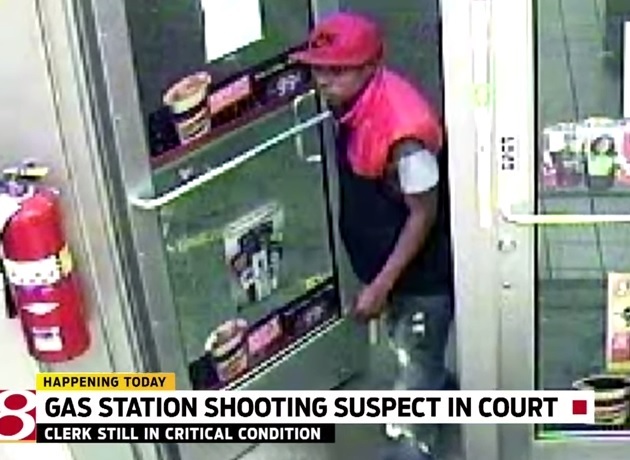 The employee told police the suspect was incoherent and acting strangely and that the suspect then left the gas station and later returned with a gun. The employee was shot in the face and the stomach. He was taken to St. Vincent Hospital in Indianapolis in critical, but stable condition, according to IMPD. His condition later changed to serious.